Desiree blogs about issues of interest to elementary educators. Her passion is reading and all skills relevant to being able to read a book. Resources from the page can be found in her storefront on the Teachers Pay Teachers Marketplace. So you're teaching in Canada and the year is wrapping up. You look to your calendar and discover that Wednesday is National Aboriginal Day. Uh oh, what can you do this late in the year to ensure students continue to learn about the cultures that make Canada? The first peoples to come to the land we call Canada were the Native Canadians 15000 years ago (or more). Experts say that they crossed the Bering Strait during the Ice Age. As a whole, they should be referred to as Aboriginal. Only One province (Saskatchewan) requires aboriginal content in all grades and most subjects, but many make efforts to ensure students learn about aboriginal contributions to Canada (The Prairies and BC especially). Today, teachers have many options at their disposal to bring aboriginal cultures into the classroom regardless of whether it is mandated by their province or board. I believe every student deserves to see themselves represented in the books their teacher reads in class. Therefore, when I was teaching in Manitoba I began my collection of books which showed characters who looked like my students. Until coming to make this list, I didn't realize how many books in this series were discontinued. It has been almost ten years since I bought them. Nanabosho is a friend and trickster and has different adventures in each book. This was first read to me in the 80's at school. It's the story of How Summer and Winter came to be. Based on Micmac legends from the region of Canada I'm from. Summer persuades Winter to let her wake up the world while he goes back North to rest for half the year. The story of a boy who desperately wants to be given a name likes his father. He grows up to be named Sitting Bull. I'm not actually sure where or how I acquired this book. And I can't find a link to it on Amazon for you, but it might be available in libraries! In this book, Stu Bear goes on a Mission to inner-city Winnipeg. Sootface is treated poorly by her sisters, much like Cinderella was treated poorly by her step sisters. You could easily use this book in class and compare via a Venn diagram to Cinderella, there really are that many similarities. Honestly, this is basically the exact same story as Sootface! So check out both and pick your favourite, or do another Venn diagram. This book takes place in Nunavut. Mikissuk and her brother have always been very close, but now he is going off on the dogsled to hunt, and she wants to join him but she is too young. A hunter can talk to animals, but when he becomes too proud of himself, he loses his ability, and the people become hungry. 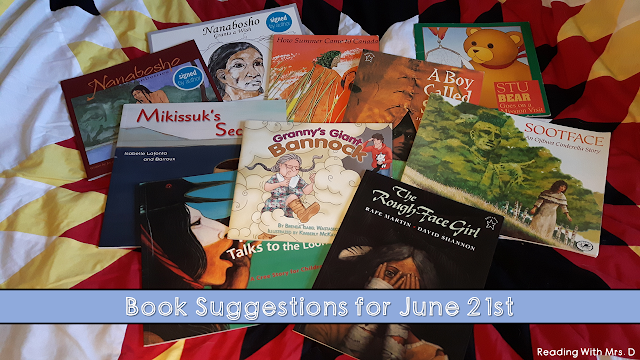 Are these all the books you could read on National Aboriginal Day? But I implore you to add some to your collection if you haven't already. 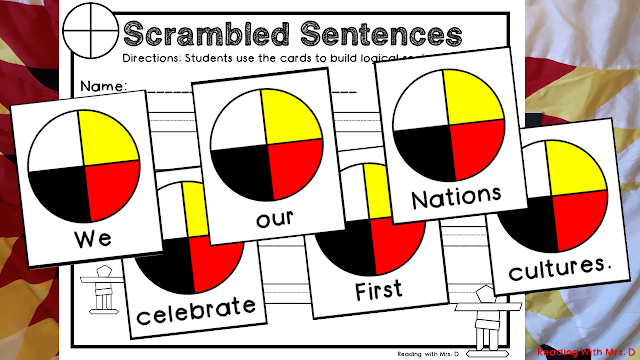 If you're looking for an activity to use for National Aboriginal Day, or for inclusion all year, check out one of my TWO Scrambled Sentences Resources perfect for this day! 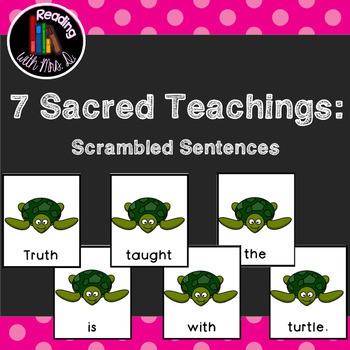 Pictured is My National Aboriginal Day Four Sentence Resource, and below is a link to the Seven Sacred Grandfathers, which could also be used this day, and throughout the year! If you are interested in being a guest blogger or would like me to guest post on your blog, please comment below or email me. I would LOVE to collaborate. 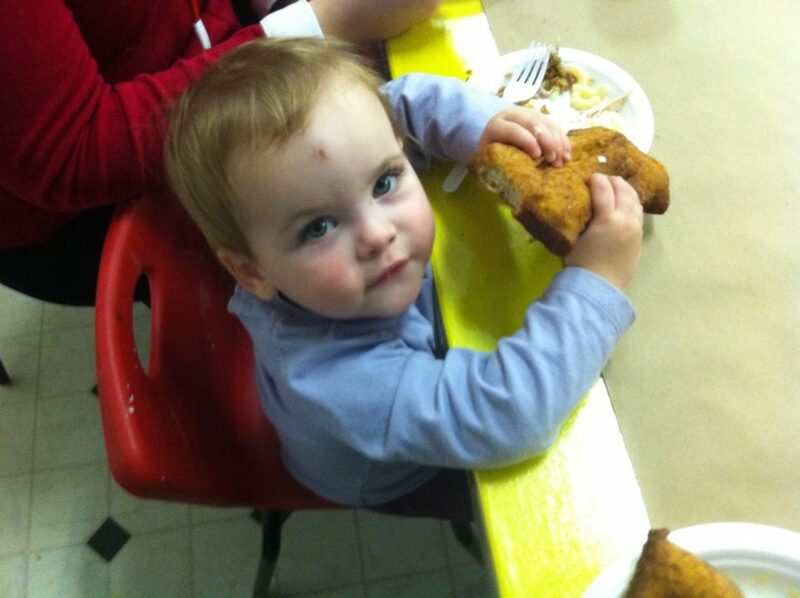 Want to find awesome resources for your Early Childhood Education classroom? Help support Reading With Mrs. D and our family. Join Swagbucks and we can both earn money to spend on our kids! These are great book suggestions. I'm not a teacher but my son would benefit from reading these as well. I had Bannock at work the other day and it is delicious! I'm a mom, wife, daughter, sister, and a friend. I'm a teacher, reader, baker, blogger, christian, geek, wanna-be-crafter, and pinterest enthusiast.